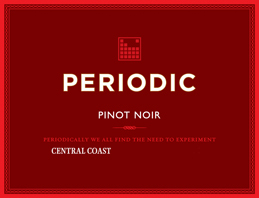 Periodic Pinot Noir is crafted primarily from grapes grown along California’s Central Coast, more specifically from Monterey County. Monterey is the ideal place for growing cool-climate varietals like Pinot Noir. Cool air funnels through Monterey Bay, making for a very mild climate throughout the year. Temperatures rarely exceed 75 degrees and fog is a regular visitor most mornings and evenings. California Central Coast Pinot Noirs are interesting and adventurous. Familiar, yet unexpected. California’s Central Coast AVA is known for its long coast and proximity to the Pacific Ocean. A very large AVA, and home to a number of highly regarded sub-AVAs, the Central Coast encompasses approximately four million acres, of which 90,300 acres are planted to winegrapes. The region produces almost 15 percent of the state's total winegrape production and is home to about 360 wineries. The cooling air flow from the fog and afternoon ocean breezes spills into coastal valleys creating a long growing season and encouraging the slow, even ripening of varieties such as Pinot Noir and Chardonnay. Conversely, many areas along the Central Coast are geographically protected from these cooling effects by low-lying mountain ranges. Their warm, dry day time temperatures are ideal for ripening full-bodied Rhone and Bordeaux varietals.